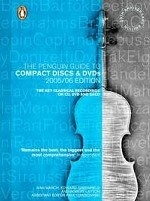 Аннотация к книге "The Penguin Guide to CDs & DVDs 2005/6"
This new, completely revised edition of The Penguin Guide surveys the key classical recordings issued and reissued on CD over the past two decades, many of which have dominated the catalogue because of their sheer excellence, irrespective of their recording dates. Now DVDs have also been added, with their extra video dimension, as well as the sound-enhanced SACDs. If you want to be sure of acquiring the finest available version of any major classical work (including DVDs of opera and ballet) you will find it listed and assessed in these pages - often with alternatives of comparable excellence and price. For those just embarking on a classical CD collection, there is invaluable advice on which works to sample.